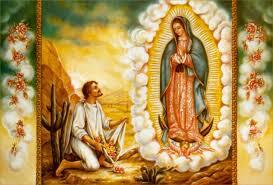 The Story of Guadalupe Research Papers discuss Mexican Culture and their ties to Catholic Church. The Story of Guadalupe, as recounted by Luis Laso de la Vega is the first written account of the espoused miraculous event that shaped the national history and direction of Mexico. Several significant factors of Vega’s account illustrate how the Spaniards used the legend as a tool to incorporate themselves in Mexican culture and change the ideology of the Aztecs to that of a lesser value than the blessed new nation that was taking form. At the time of the writing of Vega’s version of The Story of Guadalupe, other than the government, the Catholic Church was the most powerful and influential institution in the New World and in the Spain. Missionaries had attempted to convert the Aztecs to Catholicism but most of their conversions were forced and unity was not achieved between the Aztec culture and the Spanish colonists that were arriving in the New World in vast numbers. Therefore, the stage is set for government and church to band together in an effort to unite the two cultures. What better tool to use than religion. The Story of Guadalupe would serve as a national anthem for the Catholic religion, and its tradition and powerful folklore would be used to convince the Indians of the might of the colonist’s God through the Blessed Lady of Guadalupe. “You have exercised your love in a greater way, when you summoned and called a poor humble commoner in his own language and made a copy of yourself and painted yourself with flowered fragrant hues on his mantle, his maguey cloak, so that he would not mistake you for any other and also so that he would hear and take to heart your utterances and your wishes”. Paper Masters writes custom research papers on The Story of Guadalupe and discuss Mexican Culture and their ties to Catholic Church.